Pelizaeus-Merzbacher disease (PMD) is a congenital hypomyelination disorder caused by changes affecting the proteolipid protein 1 gene (PLP1) located on Xq22.2. Generally, patients with PLP1 missense mutations show the most severe form of PMD (connatal form); however, two-thirds of patients with PMD carry PLP1 duplications and present typical manifestations of the disorder, recognized as the classical form. Although Pelizaeus-Merzbacher disease and X-linked spastic paraplegia type 2 are nosologically distinguished, they are at opposite ends of a clinical spectrum of X-linked diseases caused by mutations of the same gene, the proteolipid protein 1 (PLP1) gene, and result in defective central nervous system (CNS) myelination (see the image below). (See Etiology.) This disease has a progressive and almost unvarying course, which is the clinical key to differentiating it from other entities such as infantile cerebral palsy, peripheral neuropathies or multiple sclerosis, etc. It is necessary to suspect this diagnosis and confirm alterations in the PLP1 gene with the aim of obtaining a real incidence of this entity, which is probably underestimated, like other leukodystrophies. 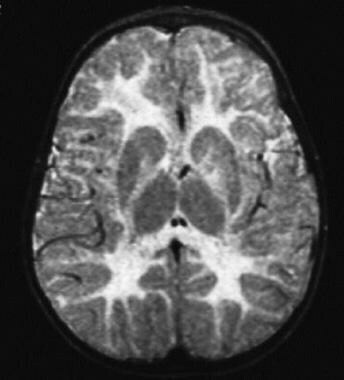 T2-weighted magnetic resonance imaging (MRI) scan of a child aged 10 months with duplication of the proteolipid protein (PLP) gene; note the high-intensity signal throughout the cerebral white matter. Families with confirmed Pelizaeus-Merzbacher disease must be referred to a geneticist or neurogeneticist for education about the disease and, especially, for genetic counseling. Pelizaeus-Merzbacher disease support online is available at http://www.pmdfoundation.org and http://groups.yahoo.com/group/PMDfamilysupport/join. Information about Pelizaeus-Merzbacher disease is also available from the National Institutes of Health (NIH) at http://www.ninds.nih.gov/disorders/pelizaeus_merzbacher/pelizaeus_merzbacher.htm. Approximately 60-70% of cases of Pelizaeus-Merzbacher disease result from duplications of the region of the X chromosome that contains PLP1 (caused, it has been proposed, by defective deoxyribonucleic acid [DNA] replication). The extent and breakpoints of duplications vary among different families. Inclusion of other genes in the duplicated region, or inclusion of aberrations of genes at the duplication endpoints, may potentially affect the phenotype. Most individuals with PLP1 duplications present with classic Pelizaeus-Merzbacher disease, typified by nystagmus that begins in the first year of life, delayed motor and cognitive milestones, and ataxia. Most of these patients acquire some language function, which can be quite good (although slow). Some patients with Pelizaeus-Merzbacher disease have been found to have 3 or more copies of the PLP1 gene. These individuals have a more severe phenotype than most individuals with duplications. Approximately 15-20% of mutations in Pelizaeus-Merzbacher disease are point mutations or other small mutations that result in base substitutions, insertions, or deletions. Base substitutions usually result in missense mutations, but nonsense mutations (ie, substitution of an amino acid codon with a stop codon) and splicing mutations also occur. Splicing mutations are now recognized as quite common and may account for almost 20% of point mutations in the PLP1 gene. The most severe form of Pelizaeus-Merzbacher disease, the so-called connatal form, usually results from missense substitutions. These severe mutations are believed to result in misfolding of the newly synthesized protein, which then accumulates in the endoplasmic reticulum and triggers apoptosis, or programmed cell death. Thus, oligodendrocyte numbers are severely reduced, and little (if any) myelin is made. Mutations that prevent any PLP1 from being made result in a syndrome (PLP1 null syndrome) that is usually milder than classic Pelizaeus-Merzbacher disease. However, these mutations appear to cause a demyelinating peripheral neuropathy, although they do not result in oligodendrocyte cell death. Interestingly, mice that have been genetically engineered to prevent PLP1 expression develop a similar pathologic syndrome, characterized by severe, late-onset axonal degeneration. Mutations that result in spastic paraplegia type 2 are generally missense mutations that do not prevent the processing of DM20, although they may interfere with the processing of PLP itself. These mutations do not appear to cause oligodendrocyte cell death. Females who are heterozygous for mutations that do not result in oligodendrocyte apoptosis (programmed cell death) continue to have oligodendrocytes that use the defective PLP1 and, therefore, are more likely to have detectable neurologic signs of Pelizaeus-Merzbacher disease. The frequency of Pelizaeus-Merzbacher disease in the United States is not known with certainty, but the estimated prevalence is at least 1 case per 500,000 population. However, this is a conservative estimate. Internationally, the frequency of the condition is estimated to be 1 case per 100,000-1,000,000 population. Pelizaeus-Merzbacher disease and spastic paraplegia type 2 are global syndromes and affect all major ethnic groups. So far, no case reports of patients of African descent have been published; however, the author is aware of African Americans with Pelizaeus-Merzbacher disease. The disease has been reported in people of Asian, Middle Eastern, and European descent. Pelizaeus-Merzbacher disease typically affects males, but female heterozygotes can be clinically affected, especially those who carry alleles that are relatively mild in males. Pelizaeus-Merzbacher disease typically begins during infancy, but milder syndromes may not be recognized until early childhood. Although most heterozygous (ie, carrier) females are asymptomatic, young girls in families with severe to classic Pelizaeus-Merzbacher disease have reportedly developed classic Pelizaeus-Merzbacher disease that regresses as the child matures, followed by completely normal neurologic health. Females who are heterozygous for the less severe alleles of PLP1 that are not believed to cause oligodendrocyte cell death or apoptosis may develop a more progressive and nonremitting syndrome, which usually begins during adulthood. Individuals with connatal Pelizaeus-Merzbacher disease typically die of respiratory complications during childhood, but with attentive care, they can live into the third decade of life. Patients with classic Pelizaeus-Merzbacher disease (such as that caused by PLP1 gene duplications) can live into the fifth or sixth decade of life. Patients with a predominantly spastic paraplegia phenotype have a normal life span and may even reproduce. Each form of Pelizaeus-Merzbacher disease may have real or apparent intervals of stability, but the overall the trend is gradual progression. As discussed below, heterozygous females who carry a severe mutation are usually healthy, but those who carry a relatively mild mutation may develop neurologic signs, including spastic paraparesis and dementia, that typically manifest during adulthood. Respiratory difficulty and stridor can be severe enough in infants with connatal disease to require the use of a tracheostomy or other airway protection. As the child grows older, the need for such measures may lessen. Orthopedic complications are common in Pelizaeus-Merzbacher disease (PMD). Joint contractures are common in the legs and, to a lesser extent, the arms. Scoliosis can be severe enough to cause restrictive lung disease. Regular physical medicine evaluations, bracing, and physical therapy, as well as other treatments for spasticity, may reduce or delay the need for surgical therapy. Dysphagia in Pelizaeus-Merzbacher disease can be severe enough to necessitate consideration of feeding tube placement. Some females with Pelizaeus-Merzbacher disease (such as the original Pelizaeus-Merzbacher disease family) probably have a clinical course much like that of affected males, in which the symptoms do not remit and may be the result of skewed X inactivation (ie, most oligodendrocytes have inactivated the normal X chromosome, and insufficient healthy oligodendrocytes are available to effectively myelinate the CNS). Dhaunchak AS, Colman DR, Nave KA. Misalignment of PLP/DM20 transmembrane domains determines protein misfolding in Pelizaeus-Merzbacher disease. J Neurosci. 2011 Oct 19. 31(42):14961-71. [Medline]. Wood PL, Khan MA, Smith T, Ehrmantraut G, Jin W, Cui W, et al. In vitro and in vivo plasmalogen replacement evaluations in rhizomelic chrondrodysplasia punctata and Pelizaeus-Merzbacher disease using PPI-1011, an ether lipid plasmalogen precursor. Lipids Health Dis. 2011 Oct 18. 10(1):182. [Medline]. Wood PL, Smith T, Pelzer L, Goodenowe DB. Targeted metabolomic analyses of cellular models of pelizaeus-merzbacher disease reveal plasmalogen and myo-inositol solute carrier dysfunction. Lipids Health Dis. 2011 Jun 17. 10:102. [Medline]. [Full Text]. Lee JA, Carvalho CM, Lupski JR. A DNA replication mechanism for generating nonrecurrent rearrangements associated with genomic disorders. Cell. 2007. 131:1235-47. [Medline]. [Full Text]. McKusick V. Pelizaeus-Merzbacher disease. Online Mendelian Inheritance in Man. Available at http://www.ncbi.nlm.nih.gov/omim/312080. Accessed: 2004.
van der Knaap MS, Smit LM, Barth PG, et al. Magnetic resonance imaging in classification of congenital muscular dystrophies with brain abnormalities. Ann Neurol. 1997 Jul. 42(1):50-9. [Medline]. Griffiths I, Klugmann M, Anderson T, et al. Axonal swellings and degeneration in mice lacking the major proteolipid of myelin. Science. 1998 Jun 5. 280(5369):1610-3. [Medline]. Wolf NI, Sistermans EA, Cundall M, et al. Three or more copies of the proteolipid protein gene PLP1 cause severe Pelizaeus-Merzbacher disease. Brain. 2005 Apr. 128(Pt 4):743-51. [Medline]. Hurst S, Garbern J, Trepanier A, Gow A. Quantifying the carrier female phenotype in Pelizaeus-Merzbacher disease. Genet Med. 2006 Jun. 8(6):371-8. [Medline]. Numata Y, Gotoh L, Iwaki A, Kurosawa K, Takanashi JI, Deguchi K, et al. Epidemiological, clinical, and genetic landscapes of hypomyelinating leukodystrophies. J Neurol. 2014 Feb 16. [Medline]. Uhlenberg B, Schuelke M, Rüschendorf F, Ruf N, Kaindl AM, Henneke M, et al. Mutations in the gene encoding gap junction protein alpha 12 (connexin 46.6) cause Pelizaeus-Merzbacher-like disease. Am J Hum Genet. 2004 Aug. 75(2):251-60. [Medline]. [Full Text]. Lazzarini A, Schwarz KO, Jiang S, et al. Pelizaeus-Merzbacher-like disease: exclusion of the proteolipid protein locus and documentation of a new locus on Xq. Neurology. 1997 Sep. 49(3):824-32. [Medline]. Tanaka M, Hamano S, Sakata H, et al. Discrepancy between auditory brainstem responses, auditory steady-state responses, and auditory behavior in two patients with Pelizaeus-Merzbacher disease. Auris Nasus Larynx. 2008 Sep. 35(3):404-7. [Medline]. Laukka JJ, Stanley JA, Garbern JY, Trepanier A, Hobson G, Lafleur T, et al. Neuroradiologic correlates of clinical disability and progression in the X-linked leukodystrophy Pelizaeus-Merzbacher disease. J Neurol Sci. 2013 Dec 15. 335(1-2):75-81. [Medline]. Mori T, Mori K, Ito H, Goji A, Miyazaki M, Harada M, et al. Age-related changes in a patient with Pelizaeus-Merzbacher disease determined by repeated 1H-magnetic resonance spectroscopy. J Child Neurol. 2014 Feb. 29(2):283-8. [Medline]. T2-weighted magnetic resonance imaging (MRI) scan of a man aged 41 years with duplication of the proteolipid protein (PLP) gene; note the increased white matter signal, as well as diffuse atrophy. T2-weighted magnetic resonance imaging (MRI) scan of a man aged 20 years with connatal Pelizaeus-Merzbacher disease due to a Pro14Leu mutation; note the severe reduction in white matter volume, as well as the increased white matter signal. T2-weighted magnetic resonance imaging (MRI) scan of a boy aged 17 years with null mutation of the proteolipid protein (PLP) gene; note the more subtle increase in signal intensity relative to that seen in the previous images, and observe that the volume of white matter is normal. The author is extremely grateful to patients with Pelizaeus-Merzbacher disease and their families for their help and support of Pelizaeus-Merzbacher disease research and to the Pelizaeus-Merzbacher Disease Foundation, the National Institutes of Health, and the Children's Research Center of Michigan for financial support.